Stephen Huneck´s Memory lives on at the Dog Mountain in Vermont. It is not only a place for those who enjoy art work that is deeply connected with his love of animals in general and dog in particular, it is also a place for those who cherish the memory of a four-legged family member they lost, but also a place to bring their living dog for hours of pure fun and frolicking. 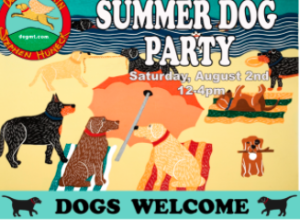 “Summer Dog Party August 2nd!